Here, you will find a selection of my quilts. My work has evolved over the thirty years since I began making quilts. The earliest quilts are more traditional, although I began exploring original design early on, always drawn to circular design. 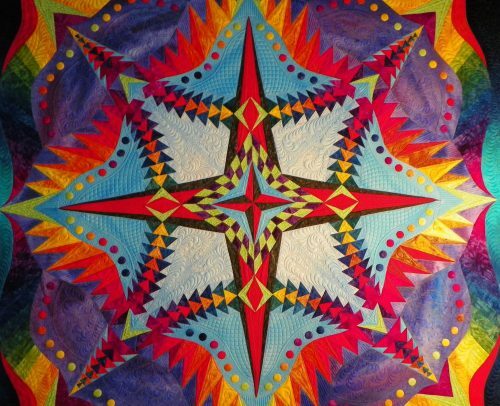 From the mid-1980s through the early 1990s, I became known for my Southwestern appliqué quilts. It was in the mid-1990s that I discovered the absolute joy in creating art quilts. We hope that you enjoy the selection that is posted here. Check back often as the quilts will change. Some of the quilts are for sale. If you are interested in purchasing a quilt, please contact me for additional information as well as a high resolution image. The student gallery features the work of many who have taken classes from me in the past. Some of the images show projects that were developed in a class, while others show work that was inspired by techniques taught in class, but were designed later. If you have a finished quilt that you would like to have considered for this gallery please contact me.